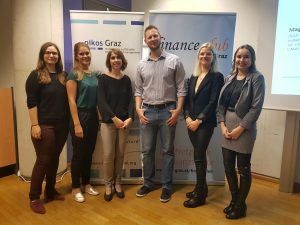 oikos Graz, in cooperation with Finance Club, hosted an event on Sustainable Finance at the Karl-Franzens University of Graz on Wednesday, October 17. The audience of about eighty people was curious to understand how to invest money sustainably. The first speaker Dr. Karl Weinmayer is Assistant Professor of Finance at the Modul University in Vienna. His current research focuses on Sustainable Finance. He showed the development of sustainable investments in the EU and globally. He pointed out that there has been an increase in sustainable investments. Weinmayer explained the different criteria applied by investors when searching for sustainable investment possibilities. Most common is Negative Screening, which excludes certain business practices, sectors or companies. Other criteria are Positive screening, Norms-based screening, ESG integration, Sustainability-themed investing, Impact investing and Corporate Engagement. For investors aiming for direct influence, the strategy of Impact investing in private markets that tackles social or environmental problems, is most recommended. Research shows that environmental protection is of paramount importance to investors. The second speaker Mag. Susanne Hasenhüttl works for the Austrian non-profit organization ÖGUT which provides a platform for organizations and companies to develop, communicate and share knowledge regarding sustainable future development. Hasenhüttl is specialized in the field of sustainable financial market and emphasizes the importance to invest money in the right place. She agreed with the screening criteria mentioned before. Product labels like the Österreichisches Umweltzeichen, FNG Label or ÖGUT certificates may also help investors to allocate money. The upcoming EU action plan on sustainable finance might also provide a legal basis for more sustainable investment possibilities. However, there is still room for improvements regarding transparency and information on financial investments. Both speakers provided great insights into the topic of sustainable finance. 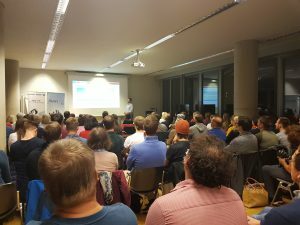 After the discussion with numerous questions from the audience, oikos Graz closed the evening with a local vegan buffet.